Birth control pills prevent ovulation by providing a steady dose of estrogen, progesterone or both to prevent spikes in these reproductive hormones. Without the birth control pill those spikes usually cause egg maturation and ovulation, but without these spikes when on the birth control pill ovulation never occurs, and without ovulation you cannot get pregnant. 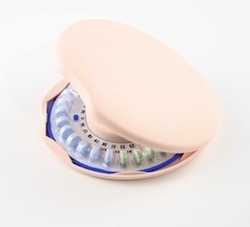 Many women miss birth control pills from time to time. Missing a pill or two can increase your chances of getting pregnant depending on where you are in the pack. Missing the pill at the beginning of a new pack: Missing one or two pills at the beginning of the pack can increase your risk of pregnancy. Take the first pill as soon as you remember. If you mis one pill, take two pills in one day. Use backup birth control for at least seven days. Missing the pill days 3 to 21: Missing one or two pills between days three and 21 of your pack should may also increase your chances of getting pregnant. Take the first pill as soon as you remember. You can take two pills in one day. Backup birth control is not necessary. Missing three or more pills in weeks one or two: Follow the same catch-up method described above. Return to your normal birth control pill cycle and use backup birth control for at least seven days. Missing Three or More Pills in Week Three: Throw away the remaining pills in your birth control pack and immediately start a new pack. Use backup birth control for at least seven days. Missing Any of the White or Inactive Pills: Throw away the pills you’ve missed and take your next regularly scheduled inactive pill. Backup birth control is not needed during this time. If you’re talking a progesterone-only birth control pill and you miss an active pill by three hours or more during any part of the cycle, use backup birth control for at least 48 hours after you restart your normal cycle.